Our friend was eager to ski Sugarloaf with us, to show off his home mountain in ideal midwinter conditions. Brilliant blue sky, a balmy 30 degrees and a strong breeze were the precursors of our day as we arrived at the Superquad at 8:20am for first chair, only to find a big red Wind Hold sign. We hoofed it up to the Double Runner, the only chair lift open, to reach the T-Bar which Art assured us was the way to go. Riding up this old school steep T-Bar is a blast from the past but pragmatic on a super windy day. From the upper mountain, our first run down the iconic Narrow Gauge was worth the thigh-burner T-Bar ascent as we scored sweet soft windblown on skier’s left. As I skied the pitch, I pictured Bode Miller, Ted Ligety, Lindsey Vonn, so many US Ski Team racers having carved these same steeps. Another T-Bar ride brought us to more snow loaded bumps on Spillway’s leeward side. 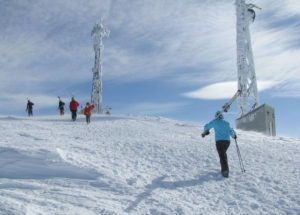 By the time we circled back to the T-Bar, we were met with a legion of Loafers, other skiers derived the same plan as us. As we waited in line, I overheard skiers praising this practical lift. “Thank god for the T-Bar today,” several said. A few even bemoaned the loss of other T-Bars that were strategically placed across Sugarloaf’s face back in the day. 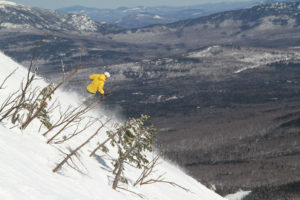 Skyline opened for a few hours and we seized that window to ski the steeps of White Nitro, Gondi line, Wedge and Sluice. Pole Line was a particularly special untracked gem. Art launched off a huge drift here and biffed – only to stand up with a heartwarming snow-eating grin. The wind kept howling but the sunshine was brilliant, views were amazing, and the Sugarloafers were all smiles. It doesn’t take a lot to make Loafers happy, they don’t need fancy lodges or lifts, just some snow, temps above zero, and a T-Bar. Add sunshine and they are ecstatic. I should mention Art was rockin’ his 80s Nevica anorak and matching purple pants – which put a smile on many a face that recognized and remembered that vintage gear. He peppered a few spread eagles and some ski ballet dance moves into our ski runs just for fun, and flashback. Lunch at The Bag was all that needed to be said and we pointed our skis there. People were pouring into this Sugarloaf institution for an early lunch. After devouring a delicious juicy Bag Burger, I see why The Loaf’s Bag is one of the best ski in ski out lunches in the East, friendly servers and simple satisfying fare steps to the ski slopes. Sugarloaf Stats: Vertical Drop: 2,820’. 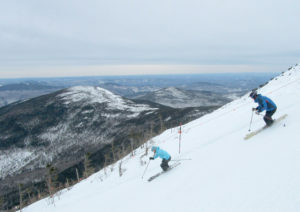 1,230Skiable Acres. 162 Trails plus Glades, 15 Lifts: 5 quads (2 high speed), 1 Triple, 6 Doubles, 2 Surface Lifts. 95% Snowmaking. 3 Terrain parks, pipes, and an SBX course. Turbo Tubing Hill. Zip Line open summer, fall & winter.